On January 1, 2010, while out taking a walk, I decided to finally launch a blog that I had been thinking about for some time. Like many others, I really felt like I needed a fresh start, and was glad to see the last decade come to an end. Although I was never one that bought into resolutions very much, (as they are often times broken before January comes to an end), I was determined to make this year the beginning of something better. A new and improved mindset if you will. My first post on this blog, entitled “Beyond Resolutions,” described that the blog would chronicle my pursuit of health, wealth and “happyness.” Please read the post to see why “happyness” is spelled incorrectly, and in quotes. Millions of people promise to take better care of themselves as the holidays end, after they’ve eaten too much, exercised too little or a combination of both. The gyms get crowded, but start to thin out little by little. Once the holiday bliss fades, and people return to “the grind,” stress starts to set in, and excuses are made. I’ve been there and done that enough times to recognize the pattern. However, I am determined to make real changes in a permanent way. The simplest way to determine my success in this area is by measuring my income. However, I don’t think that using money as a measuring stick is a good idea because it fails to take into account actions that I have taken to build towards the future. Using actions taken to plant the seeds for the future as a measuring stick, I’d say that it was a good month, and a solid start. But there is more work to be done in all areas. Working on different projects requires the ability to prioritize, juggle and set aside the proper amount of time for each. Since this is the first time that I’ve ever worked on more than one unrelated project at once, it didn’t go as smoothly as I had hoped. While most of the important things got done in my desired timeframe, one project is still in the “waiting room” (so to speak). As my journey continues, I need to work on improving my time management to make sure that nothing falls through the cracks. The project that didn’t receive nearly enough attention is one that didn’t have deadlines or other people counting on me to make it happen. It is really designed to create another stream of income while pursuing better health. I am looking forward to getting it off the ground, and sharing it with others as soon as possible. My goal is to make sure that February is better than January was. And since I am looking at this as a marathon, and not a sprint, I can already say that my goal in March is to do better than I do in February. I can honestly say that 2010 has been better so far than any point in 2009, and most of it can be attributed to my renewed sense of discipline and determination to reach my objectives. Have there been bumps in the road? Absolutely! But there is one big difference this year, and that is my ability to deal with adversity, recognize it for what it is, and continue on my journey. After all, it is the pursuit of “happyness” that I am focused on, NOT the pursuit of perfection (which I know does not exist). My overall progress in my pursuit of health and wealth has been a key factor in my pursuit of “happyness,” but it is only part of why I am encouraged by 2010 so far. I’ve enjoyed writing every day, and connecting with people on a whole new level. There have been great moments with my family, which is really what all of this is about in the long run. Perhaps my biggest achievement so far this year though is helping to get the Olivia Grace Armand Foundation launched. In the time since Olivia’s passing, some incredible progress has been made. Like me, the foundation is a work-in-progress, but things are definitely headed in the right direction. The logo has been completed, and it has truly captured the spirit of both Olivia and the goals of the foundation. Fundraising events are being planned, and the overall awareness of the foundation is nothing short of incredible. I truly believe that the best is yet to come for a foundation that is going to change many lives in the future. While I am truly saddened by the reason for the foundation’s existence, I am proud to be a part of it and doing something positive to help my friend Trish put the pieces of her life back together. Is persistence a positive or negative character trait? The answer to that question really depends on who you ask. Those who are persistent tend to think of themselves as “determined,” even though others may think of them as being “pushy” or “overbearing.” It also depends on what the situation is. People who need to make sales to put food on the table have no choice but to embrace persistence. This is not to say that this mindset comes easily, especially since the underlying fear of alienating people is always lurking in the background. But overall, the positives of being persistent outweigh the negatives. There are many days when people in sales feel like they are pushing a boulder up a hill, and it can become very frustrating. This is especially true if the prospect has given an indication that they are interested in your product or service, but still won’t make a commitment. Very often, the prospect will be caught up in their day, and ask you to call back at another time. Even if you call back at the exact time that they asked you to, there’s a good chance that something will come up to further delay the process, causing the call or meeting to be rescheduled again. Unless your offering has an expiration date, or is simply something that the prospect needs for their business immediately, it can be challenging to get a firm commitment. This is especially true in a weakened economy where price shopping is the norm. However, price shopping takes work, and it can be a tedious process. Business owners who already feel like there are not enough hours in the day aren’t necessarily going to find the time to shop around. So they delay the process as long as they can, promising themselves that they are going to make the time to do their research and then make a decision. After a few contacts with no positive results, salespeople have a tendency to get pessimistic and move on to the next prospect. After all, new prospects bring new hope for success. This week (today in particular) a number of deals finally came to fruition. About half of them would not have happened without persistence. These people may very well have had the best intentions, but put off making a decision for one reason or another. Had I given up on them because of frustration or fear of becoming a nuisance, everyone would have been worse off. I wouldn’t have made the sales, and they wouldn’t have taken advantage of an opportunity to save money. A lot of money in some cases! In the end, I wasn’t really risking anything by being persistent. Although, the prospects could have thought of me as being “pushy,” I didn’t know them before, and the chance of crossing paths with them in a business or social way was remote at best. They could have told me “no,” but that isn’t actually a bad thing in sales. At least then, it is a clear indication to move on to the next prospect. FEAR OF REJECTION – This is something that most people have to some degree because of our egos. In my case, I never really liked walking up to a group of girls in a bar when I was single. However, being rejected in sales is part of the job, so I never look at it as a reason not to take action. FEAR OF PERCEPTION – People generally want to be liked. They don’t want to be thought of as being “annoying.” This never enters into my mindset. If the prospects were total strangers to me before, why should I care what their lasting perception of me is going to be, especially if they are not going to work with me anyway? The biggest deal that closed this week was the one that I had been working on for the longest time. I had called this prospect more than any other, and continued to do so even when I started to feel like I was becoming a nuisance. As a result of my persistence, a big deal was closed, and the client is going to save a lot of money over the next year. The client had absolutely no negative feelings towards me whatsoever. In fact, the client gave me credit for my tenacity in one of the final e-mails leading up to the closing of the deal. It took a while, but this week, my persistence finally paid off! Did you ever wonder where cliches come from? Most of the time, these little catch phrases that we throw around make little (if any) sense when taken literally. Yet we constantly use them as a part of our regular vocabulary without ever giving it much thought. We have all accepted that “spilling the beans” means revealing a secret of some kind. Most of the time, they are not secrets that are life-altering. In fact, the most common use of the phrase is when someone ruins some kind of surprise that would have been revealed in the near or distant future anyway. If you ever want to make sure that someone “spills the beans,” tell your secret to a 3-yr old and tell them not to tell anyone. It’s a virtual guarantee that the secret will be revealed as soon as humanly possible. At least that is the case with my little girl. You should see the smile on her face when she reveals the contents of a gift-wrapped box, just as the recipient is about to open it. Sometimes, it doesn’t even get that far. There have been times recently where my daughter literally “spilled the beans” as we were walking in the door to someone’s house with a gift. Clearly, 3-yr olds have no filter. If you are ever looking for an honest opinion about something…ask a 3-yr old. They are like miniature versions of Simon Cowell – brutally honest, with no regard for someone’s feelings. So it should come as no surprise that their ability to keep a secret is virtually non-existent. Yesterday, my daughter found a way to bring the cliche from the abstract to the literal as she grabbed a bowl of beans that my wife was preparing for dinner, and spilled them all over the floor (see photo above). This, despite several warnings not to touch the bowl. Although I wasn’t there to witness it, I was only in the door for about 30 seconds when my father-in-law and son “spilled the beans” about what had happened shortly before my arrival. Unfortunately, this was just one example of defiance in what has become a bit of a limit-testing ritual. Yesterday was a particularly bad behavioral day, filled with tantrums, bossy demands and my 3-yr old’s version of vandalism. We all have our bad days, but they usually are based on the day’s events, not random, attention-seeking acts. Had I been there to witness this, I would not have been pleased (to put it mildly). But by the time that I found out about it, everything had been cleaned up (although not before photo evidence was taken at the scene of the crime). 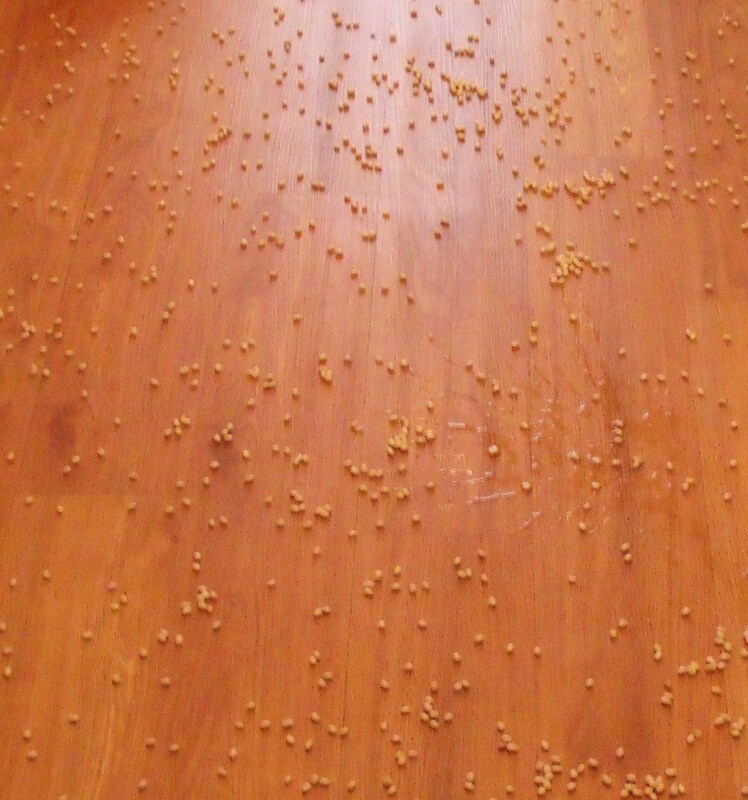 I lied down next to my daughter in the living room and calmly asked her why she spilled the beans all over the floor. She rolled over, smiled from ear to ear, gave me a big hug and a kiss, and said…“because I love you!” Suddenly, her irrational act of defiance didn’t seem so bad. Sure she spilled the beans, but she obviously had a perfectly justifiable reason for doing so! Life seems to be about creating routines. Sometimes we choose our routines consciously, sometimes unconsciously, and sometimes they are chosen for us. Every morning for the past couple of weeks or so, after my daughter and I drop my son off at school, I help her out of her car seat, get her feet on the ground, and she takes off running towards the front door. Usually when she is about half-way there, she’ll shout out “On your mark…get set…GO!” Gotta love a kid that knows how to give herself an edge! Even with her head start, I still have the speed to win if I really wanted to, although I suspect that the time is coming sooner than I think where I will no longer be letting my kids beat me in a race. She is always excited when she gets to the door first and claims her victory. This is one race that I hope to lose for a long time to come. At some point, my little one will start to grow up, and most likely lose her enthusiasm for winning a fixed race. But for now, it is something that I look forward to. It starts the day off on a high note. However, some days, I feel like I truly can’t get out of the starting blocks against an opponent that is not nearly as cute – the grind of life. As much as I have done to make improvements in my life, I am not immune to life’s disappointments and frustrations. Anyone who has ever worked in sales knows how frustrating it can be at times. There are some days when things are clicking on all cylinders and you feel like you are invincible. But there are also days where you feel like you can’t get out of your own way to get the job done. Yesterday was one of those days. It seemed like every call that I made was met with some sort of road block or unnecessary negativity from the person on the other end. The temptation was there to just pack it in and call it a day before things got any worse. However, I set a goal to make a certain amount of calls, and I was going to make those calls even if every person piled on to an already challenging day. As I reached the final call, I was relieved that the day was coming to an end. With the way that things were going, I had very little expectation of a positive outcome, but I made the call anyway. Success! The person on the other end of the line was very happy to hear from me. At that moment, I was very glad that I willed myself to keep going in the face of what seemed like endless defeats. Had I quit early, the day would have felt like a failure on two accounts. Striking out for the day is one thing, but quitting before reaching my self-imposed goal would have made the day feel like a total failure. When I got done with the call, I checked my voicemail and actually got a return call from someone else that was ready to do business. We had a great conversation, and a few laughs as we shook our heads in disbelief at the problems that he was dealing with due to the robots that work in government. If I had given up on the day, I never would have made this connection. I can only control my actions. I cannot control the actions or reactions of others, only how I respond to them. Potty Training in 2 Hours! Being the dad of a 3-yr old girl is a lot of fun. She is always saying and doing things that leave me surprised and entertained. However, 3-yr old girls can also be challenging and frustrating at times. Somehow, she has managed to make the potty training experience surprising, entertaining, challenging and frustrating all at once. She is much more interested in the rewards that come with being potty trained than she is with doing the actual work (I guess that she is like many adults in that way). She is also very adult-like in her response when I ask her when she is going to go on the potty. The answer is sometimes animated, sometimes delivered in a very matter-of-fact way, but always the same – “2 HOURS!” Suffice it to say, these have been the longest two hours of my life. I am all about the bribes and the rewards to speed up this “2-hour” process. My wife realizes that this method is not likely to produce results anytime soon, so she made the executive decision to let my daughter wear underwear around the house in the hopes that she will tell us when she has to use the potty. While I know that this is probably the best approach, the thought of her having an accident on the carpet (or God forbid – the couch) makes me crazy. My daughter loves wearing “big girl” underwear, but still has no desire to actually go on the potty (regardless of the rewards). So far, we have learned that she can actually “hold it in” for much longer than we thought possible. Unfortunately, when the moment of truth arrives, she just lets it fly and then calls for the maintenance crew (Mommy) to come and take care of it. Yesterday, my daughter was seemingly trying to achieve the best of both worlds – wearing underwear with the protection of a diaper. She came into the living room and told us that she put a wipe in her underwear. I wanted her to take it out, but my wife thought that it was funny and didn’t think that there was anything wrong with it. So far, my methods have produced no results, so I deferred to my wife on this one, even though I disagreed with the “wipe in the underwear” potty training method. I couldn’t help but laugh when my wife emerged from my daughter’s room with the final tally of wipes that she stuffed into her underwear – THIRTEEN! At that moment I knew for sure that potty training my daughter is going to take more than the two hours that she keeps promising. On August 29, 2005, Hurricane Katrina devastated the city of New Orleans. The Superdome was used as a makeshift “shelter of last resort” for those who were unable to evacuate New Orleans before Katrina hit. However, during the storm, a large section of the outer covering was ripped off by Katrina’s 140-mph winds, rendering the Superdome unsafe, and leaving the Saints without a home. In the scheme of things, the loss that was suffered by the people of New Orleans was much worse than a football team not having a home stadium. However, the Saints are important to the people of New Orleans, so not having them to cheer for only made matters worse. Scrambling to find a place to play their home games, the Saints were able to work out their schedule so that they played half of their home games in LSU’s Tiger Stadium in Baton Rouge, and the other half in the Alamodome in San Antonio, TX (although their first “home” game ended up being at Giants Stadium). Initially, it seemed that there was no way that the Saints would ever be able to return to New Orleans. Even if the Superdome was returned to its pre-Katrina condition, who would come to the games? It was believed that the people of New Orleans would be so focused on rebuilding their lives, that they wouldn’t have the time, money or inclination to support their beloved team of nearly 40 years. While everyone sympathized with the plight of the people of New Orleans, most football experts and fans believed that they would never be able to support an NFL team again. Against all odds, the Saints played their 2006 home opening game in the Superdome on September 26th. It was a Monday night, in front of a national audience, against the Atlanta Falcons. The Saints came into the game having already won their first two games of the season on the road. It seemed that everyone in the country (with the exception of Falcons fans) was pulling for the Saints to win the home game that most thought would never come to fruition. I still remember the game as if it happened last week. You could feel the electricity of the crowd just by watching on TV. The Saints played the game as if it were the last game that the franchise would ever play, rather than the first of many that they would play in the Superdome. When it was all said and done, the Saints emerged victorious by soundly thrashing the Falcons by a score of 23-3. It was, by far, the most exciting non-playoff game that I have ever seen. The record books will show that the victory went to the Saints. However, the real victory belonged to the people of New Orleans, as they proved beyond a shadow of a doubt that the Saints belonged to them – NOT San Antonio, NOT Los Angeles or ANY other rumored destination. It would have been very easy for the people of New Orleans to worry about their own personal well being, and not to focus on keeping a football team from relocating, as so many other teams had already done to their respective fan bases. But the Saints are more than just a football team to the people of New Orleans. They are a part of the culture, just like Mardi Gras, jazz music, alligator-filled swamps and a whole lot more. Losing the Saints would have meant losing a part of the proud culture that exists in New Orleans, and the team never would have been the same had they relocated. The Saints have been a part of the NFL since 1967. It took 34 years for the team to win its first playoff game. It would seem that a team like this would be “ripe for the picking” and easy to move to another city. However, the Saints have one of the best fan bases in the NFL. The fans NEVER quit on their team. Not during the losing years, and not during the most difficult time that the city has ever endured. When the Saints take the field in Miami for Super Bowl XLIV, they will do so as more than just the best team in the NFC. They will take the field as a shining example of what can be achieved with perseverance. It is only fitting that they will do so with quarterback, Drew Brees, at the helm. At 6-0 tall, and weighing only 209-lbs., Drew Brees is anything but the prototypical NFL quarterback. His early struggles when he came into the league caused his first team (the San Diego Chargers), to draft a quarterback to replace him after only three seasons. Brees could have easily cashed a paycheck and accepted a role as a career back-up quarterback, but he believed in himself, and was determined to prove his worth. He is now considered by most to be one of the top quarterbacks in the NFL. Players in the NFL are pre-judged by their measurables (height, weight, speed, strength). Those with the “right” measurables for their respective position are given chance after chance to live up to their potential. On the other hand, those that do not possess ideal size, speed and strength must continue to prove their worth even after they’ve achieved a degree of success. In 2005, the city of New Orleans tied a collective knot and hung on to their Saints, despite predictions from outsiders that they couldn’t. It took five years, but they have finally been rewarded for their perseverance with their first-ever trip to the Super Bowl. I, for one, hope that this story has a Hollywood ending, and that the Saints emerge victorious against the Colts! We made the decision to move to Texas to give my kids a better life. Even though my son is (and always has been) wise beyond his years, the concept of a better life was difficult to comprehend, especially considering that it meant giving up his home, his school, his friends and proximity to most of his family. While the transition hasn’t been easy on any of us (with the exception of my 3-yr old daughter), it was most difficult on my son. Needless to say, my wife and I both worried about how my son would handle the move – particularly the change in schools. When we met my son’s teacher early in the year, she gave us a glowing report, and told us that he seemed to be adjusting very well, not just academically, but socially as well. Like his pre-school, kindergarten and first grade teachers, his current teacher told us that she wished that she had a classroom full of kids like him. This is not to say that he is perfect, or that I am some starry-eyed parent who only sees his children through rose-colored glasses. It just so happens that my son, who has excelled in school with nearly perfect grades, saves all of his not-so-perfect moments for us at home. I am very proud of the fact that my son’s behavior in school is beyond reproach. I imagine that it has something to do with his maturity level, which he displayed to me last week at the trophy presentation for his football team. At the end of the team lunch where the trophies were presented, my son’s coach gave a brief speech. In his speech he told the team that playing football is costly for parents, and that it is something that we all work hard to pay for. He then asked the team to give the parents a round of applause to show their appreciation for us. Most kids clapped politely. My son, who has been learning the value of money, stood up and gave me a big “thank you” hug as tears welled up in his eyes. He may not be one of the all-stars on the field, but off the field, no kid on the team is in the same league as far as I’m concerned. Respect for teachers and parental appreciation are great qualities that my son possesses. But perhaps the moment that has made me most proud recently is my son’s generosity towards others. If you’ve been reading my blog, you are already aware that my friend Trish recently lost her daughter to a rare metabolic disorder. Unfortunately, Trish’s son, Mikey, suffers from the same disorder. My son has gotten to know Trish’s children through the videos and pictures on Facebook, and by asking me questions about both of them. Olivia Grace Armand passed away two weeks before Christmas. Although it was only a small gesture, I wanted to get Mikey a gift. I decided on a NY Jets blanket since Trish is a big fan of the team. My son saw the blanket on the computer screen and asked me what it was for. When I told him what I was doing, he told me that he wanted to pay for it with his own money. I told him that it wasn’t necessary, but he insisted. After a bit of negotiating, we agreed to split the cost, but that he would pay the extra penny. During checkout, there was an opportunity to donate a dollar to a military charity. Without hesitation, my son asked me to make the donation and to allow him to pay for it. Once the order was complete, I asked him if he wanted to make a card for Mikey to go with the gift. He immediately sat down and made a card with a NY Jets theme. For a 7-yr old kid, my son is acutely aware of things that are going on in our lives, due in part to his penchant for eavesdropping on conversations that I have with my wife. He knows that I am a part of the Olivia Grace Armand Foundation that was started recently. When he found out what the foundation was all about, he went running into his room to donate his own money because he wanted to help. I told him that I’ll find a way for him to contribute without having to spend the money that he’s been saving. I also let him know that he can make a bigger difference by helping to raise money than he could by just donating some of his own. I have certainly made my fair share of mistakes in life that I would like to go back and fix. But it is easy to leave those mistakes in the past when I think about how lucky I am to have a caring, generous son who is willing to go the extra mile to help others…it makes a dad proud! On December 11, 2009, at 8:16pm, Olivia Grace Armand passed away (10 days before her 5th birthday). Olivia had a very rare metabolic storage disorder called I-Cell. When her mother, Trish (my good friend my high school), sent me the text letting me know that “Cookie” was gone, my heart sank. We spoke on the phone while Trish was still in the room with Olivia. Words cannot describe the sheer anguish that we both felt. To make matters worse, Trish’s other child, an adorable little boy named Mikey, suffers from the same rare disorder that took his sister’s life. This kind of devastating loss renders many people almost useless. But not Trish! She is sad…very sad. She misses so many things about her amazing little girl. We all do. At least those of us who got to know Olivia through the videos and pictures that Trish posted on Facebook. Rather than curl up into a ball and shield herself from the world, Trish decided to do something that will change the lives of many other people faced with the same situation. Within a week of Olivia’s passing, Trish established the Olivia Grace Armand Foundation –www.OliviaGraceArmandFoundation.org. The Olivia Grace Armand Foundation will provide scholarship funds from “The Cookie Jar” to inspired nursing students, or nurses who want to further their education in Pediatrics. There will be annual fundraisers to help keep“The Cookie Jar” filled. This is Trish’s way of “paying it forward” to those that dedicate their lives to helping others, like the amazing nurses who have been there for Trish’s children time and time again. One of the ways that Trish is promoting the foundation is through a Facebook fan page –http://www.facebook.com/group.php?gid=240224893166&ref=ts. When I woke up in the middle of the night two nights ago, I checked to see how many people had signed up. At the time, there were 917 people. I put out an update encouraging my friends to join to help reach 1000 members (a goal that Trish set). Within hours, several people had copied the update and made it their own. Friends of friends started doing it as well. By the afternoon, 50 people had joined, leaving only 33 to reach 1000. I put out another update thanking people for joining, and letting them know that we were on 33 people away from 1000. Within minutes, others copied the new message and made it their update. And then it happened! The foundation fan page reached 1000 members in almost no time. By the end of the day, 31 of my friends had become a fan of the foundation. Some of the friends that signed up were from the town that Trish and I grew up in. Others came from a variety of places (fellow sleep away camp alumni, friends from college, co-workers from previous jobs that I’ve held, industry contacts, and bloggers from around the country who I have never met face-to-face, but still consider them to be good friends). The 1000th member turned out to be one of my friends from college, who I hadn’t communicated with since graduation (until Facebook). Trish was so appreciative of the show of support that she decided to reward the 1000thmember by sending her some cookies and a Starbucks gift card (because Olivia’s favorite cookies were from Starbucks). What an incredible woman! In her darkest hour, she still has the ability to give back to others. Through the tears that flow regularly, she was able to smile at the progress that it being made in the name of her beautiful daughter. At this moment, there are 1143 members of the Olivia Grace Armand Foundation fan page. This is a great start. The more exposure that the foundation gets the more successful it will be in generating donations and raising funds for a very worthy cause. With the power of social networking, the exposure can increase exponentially without much effort at all. If each of the 1143 members brought in 2 new members, there would be 3429 members. If those new members each brought in 2 new members, there would be 8001 members. And if those new members brought in 2 new members, there would be 17,145 members. The potential for growth is extraordinary when you look at it in these terms. If everyone just took a few minutes out of their day to help spread the word and “pay it forward,” amazing progress could be made. What if each member donated $2 and got two more people to do the same? With very little effort, and for less than the cost of a large cup of Starbucks coffee, “The Cookie Jar” could be overflowing. How many people would benefit from having more dedicated, caring, passionate pediatric nurses? Think about it…if your child needed to be hospitalized (for even the smallest ailment), wouldn’t you want a nurse that would take care of him or her as if it was their own child? Please consider becoming a fan of the Olivia Grace Armand Foundation page on Facebook if you haven’t already. If you are already a fan, please do what you can to help spread the word, and set a goal of bringing 2 of your friends into the fold to do the same. Many people are struggling financially nowadays, but it is hard to imagine that we can’t each come up with a $2 for such a worthy cause. We can all make a big difference with very little effort or expense. For some inexplicable reason, human nature dictates that those on top think that they will always be there. Most people believed that the stock market would continue to rise, even though history has shown that not to be the case. Almost everyone thought that investing in real estate was a relatively safe bet, rationalizing that (unlike stocks), real estate was a tangible asset and people always need a place to live. While this is true to a degree, the fact of the matter is that the belief that something will continue to happen just because it has in the past is nothing more than complacency, fueled (often times) by irrational exuberance. After Googling “Scott Brown Election Results,” I found an interesting article http://www.abc.net.au/news/stories/2010/01/20/2796925.htm?section=world that highlights the fact that Scott Brown used Google and social networking to help win the election. I also found out that Ms. Coakley’s first name is Martha, which is something that I would have known had she not been so complacent, thinking that she had the election won simply because she is a Democrat in a Democratic state. Ironically, Scott Brown used many of the same methods that Barak Obama used to win the presidential election. This particular show of complacency is simply the latest one to take place in the public eye. Every day, the news is littered with examples of crumbling empires that were once thought to be impenetrable (Enron, Lehman Brothers, etc.). We’ve all seen how complacency nearly brought the world’s entire banking system to its knees. Complacency has caused the newspaper industry to endure such a colossal tumble that it is impossible to imagine them ever returning to the prominence that they once held. In my own career, I witnessed a permanent shift in the music industry as the major record labels summarily dismissed file-sharing and downloads as a realistic way for people to consume music. I have seen magazines (who thought that they had no competition in their niche) treat their readers as an afterthought by raising subscription and newsstand prices. And then turning around and raising advertising prices in spite of the fact that new competition was arising in one form or another on a regular basis. I saw the real estate industry forever-changed by the Internet, which has empowered consumers by providing them with information that was once closely-guarded, and difficult to obtain without the help of a real estate professional. It is truly amazing to see how often history repeats itself because of complacency, and yet the lesson never seems to stick. Life has a way of creeping up on us while we’re not paying attention. Change happens whether we want to believe that it will or not. The past is not a guarantee of what is to come in the future. The thing about being on top is that there is no place to go but down. The only way to stay on top is to avoid falling into the trap that is – complacency!